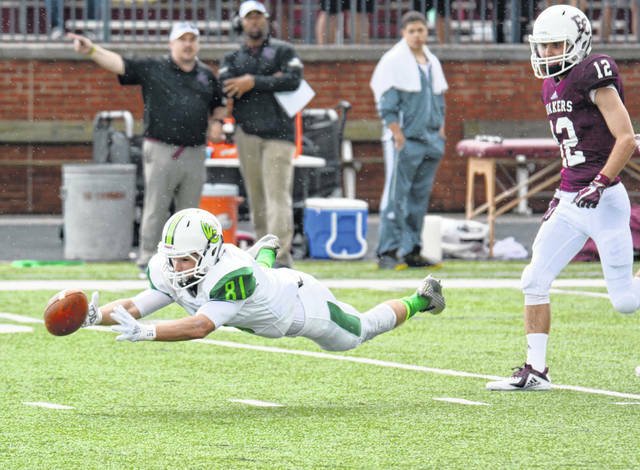 Wilmington College receiver AJ Hightower goes all-out to make a catch during the Sept. 1 game against Earlham. WC won the game 49-7. WILMINGTON – After a week off, the unbeaten Wilmington College football team opens Ohio Athletic Conference play at unbeaten Ohio Northern University 1:30 p.m. Saturday at Dial-Robertson Stadium on the ONU campus. Wilmington opened its season with a 49-7 win over Earlham on Sept. 1. The Quakers then took the week off while the Polar Bears were winning their second game over OAC rival Muskingum, 42-14. The week off, which WC has each season following its opener, is a double-edged sword for coach Bryan Moore and his squad. In Wilmington’s big season-opening win at Earlham, several county prospects had big games. Clinton-Massie graduate Weston Trampler had three sacks to lead the WC defense. Luke Richardson, another CM product, had a big-play touchdown in the win. Blanchester grad Dylan Fawley was part of an offensive line that helped produce 496 yards. Wilmington has not defeated Ohio Northern since becoming an NCAA Division III program in 1990. Last season, however, the Polar Bears escaped Williams Stadium on the WC campus with a 49-45 shootout victory. Anthony McFadden is the ONU quarterback and clear centerpiece to the offense. Early numbers this season have McFadden averaging 178 yards passing and eight yards per rush then he tucks and runs. Kyle Barrett, the WC signal-caller, was 13 for 16 passing for 294 yards and a pair of scores in his first collegiate start against Earlham. DJ Chambers rushed for 73 yards and a pair of TDs in the opener. Despite the week in between games, Moore said not much will change for the Quakers when the head north to Ada Saturday morning. And some of those little things can be the difference between winning and losing.